NEW ORLEANS, Lousiana, September 3, 2010 (ENS) – An explosion ripped through an offshore oil platform in the Gulf of Mexico off the coast of central Louisiana at about 9:19 am Thursday CDT, throwing 13 crewmembers into the water. U.S. Coast Guard spokesman Petty Officer Prentice Danner said all were rescued alive by a Coast Guard vessel. All 13 people were wearing immersion suits. The 13 crewmembers were picked up by the offshore supply vessel Crystal Clear and taken to another platform. Coast Guard helicopters transported the rescued to Terrebonne General Medical Center in Houma, Louisiana, where none were reported to have sustained serious injury.. The explosion and fire on the rig were first reported by the pilot of a commercial helicopter who called the Coast Guard at about 10 am local time. The Coast Guard responded with seven helicopters, an aircraft and four boats and a commercial helicopter also responded. Mariner Energy of Houston, Texas, the owner of the platform, deployed three firefighting vessels to the scene and extinguished the fire. Coast Guard vessels and aircraft on scene saw no evidence of sheen or leaks, and Mariner Energy reported that the platform, called Vermillion Block 380, has been shut in. The site of this latest explosion is about 90 miles south of Vermilion Bay on Louisiana’s central coast, to the west of the BP/Deepwater Horizon explosion in April that killed 11 crewmembers and started a three-month long oil spill. Mariner issued a statement confirming that a fire has occurred at a production platform located on Vermilion Block 380, saying the rig is located approximately 100 miles from the Louisiana coast. 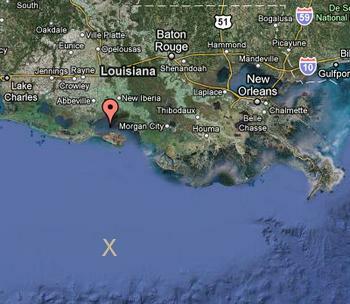 Map indicates the approximate location of the Mariner oil rig on Vermillion Block 380. “All 13 members of the crew have been evacuated and safely accounted for. No injuries have been reported. In an initial flyover, no hydrocarbon spill was reported,” the company said in a statement Thursday. 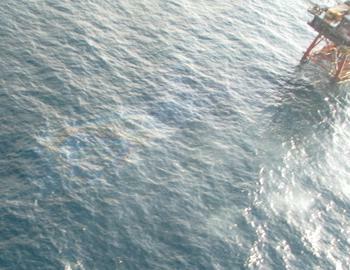 Following a Friday morning overflight, a light rainbow sheen was reported in the vicinity of the Vermillion oil platform by the crew of a Coast Guard helicopter. “The residual sheen, about a hundred yards long by ten yards wide, is believed to be petroleum runoff caused by fire-fighting efforts,” the Coast Guard said. Federal investigators from the Department of the Interior’s Bureau of Ocean Energy Management, Regulation and Enforcement are on the platform to investigate, confirm the source of the sheen and verify that the flow of oil to the platform remains secured. During the last week of August 2010, production from this facility averaged approximately 9.2 million cubic feet of natural gas per day and 1,400 barrels of oil and condensate, Mariner stated. Mariner is among the largest independent oil and gas companies operating in the Gulf of Mexico with nearly 350 offshore leases, 110 of them in production.